What is Arts Advocacy Day? If you’re not into writing a letter to a congressperson or rallying at the Capitol, then volunteering at local Arts events will provide Arts opportunities for local communities and schools. 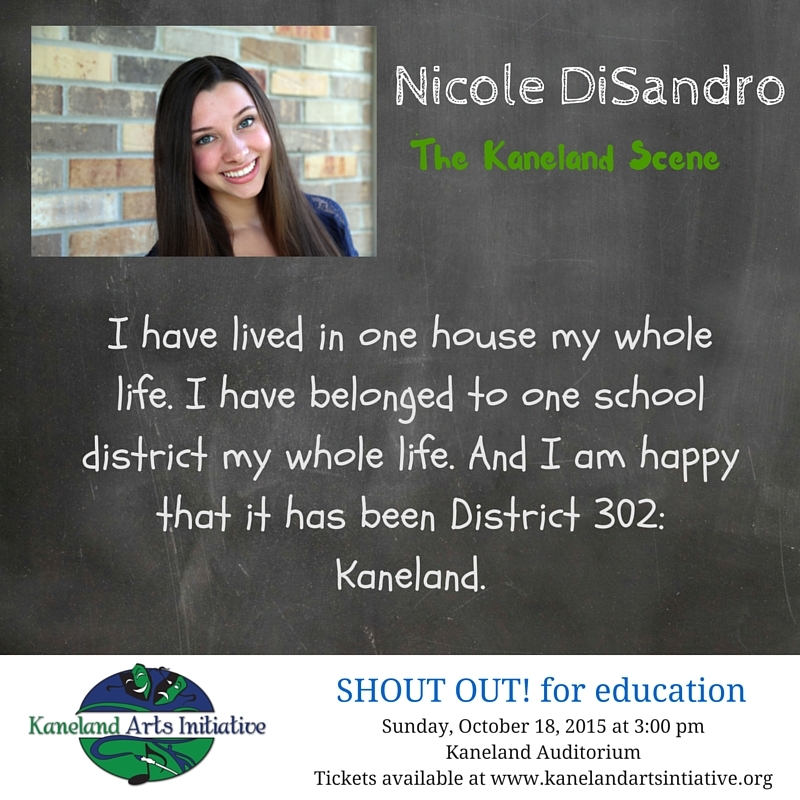 The Kaneland Arts Initiative gives professional quality Art experiences to families and students within our community. We are always looking for volunteers for our events. Please consider advocating for the Arts locally and nationally. To volunteer for KAI events, please email Volunteer Coordinator Extraordinaire, Laura McPhee. We are always grateful to you for your support of the Arts! January flew by and KAI had two wonderful events to start of 2016. The annual Lee Murdock Hometown Concert with Special Guest, Tom Kastle, was a fabulous event on January 2nd. Art students from Kaneland Harter Middle School showcased their work in the lobby of the auditorium and Lee and Tom told stories and created beautiful music. The end of January brought us to the world premiere performances of 2001 Kaneland Alum, Nic Wehrwein, new play, Memorial Park. The Company of Memorial Park with the author, Nic Wehrwein. The story detailed a pivotal day of young Mars, played by the talented Mace Jendruczek, and his family performed with great clarity by mom, Trisha Mills, and dad, Peter Lopatin. They encounter a drifter named Fiddley Diddley, a war veteran with a past and a struggle with substance abuse, and all are forced to face demons of substance and domestic abuse and the choices that they make. Doug Orlyk, who formerly directed KAI’s most recent summer production, big! the Musical, developed this role into a intriguing mix of funny and sad, troubled and insightful. The cast was rounded out by the well-played supporting roles of Betsy Mills as the narrator and Lyndsay Mach as Mars’ girlfriend. Brilliantly directed by the always insightful KAI Artistic Director, Diane McFarlin, Memorial Park, was both riveting and funny in its portrayal of these real characters. The crew made up of all Kaneland students did a fabulous job running the backstage and technial parts of the production. Fresh off the successful performances of Memorial Park, the Kaneland Arts Initiative (KAI) presents two February events that are family-friendly, fun, and affordable. On Saturday, February 20th at Open Range Southwest Grill Restaurant in Sugar Grove, KAI will hold its 7th Annual Fine Arts Feast. This event is the annual fundraiser inviting new and returning Individual Arts Patrons to come together for an evening of information and entertainment. Tickets are $10 for this buffet pizza dinner with amazing musical numbers. This year’s Feast celebrates the FREEDOM TO FLY, a cabaret style performance by Kaneland Arts Initiative staff, committee, and friends. KAI is raffling 2 Blackhawks tickets including a parking pass for the March 22nd home game against the Dallas Stars and will also be offering some great items for auction during the evening. All proceeds from this event will benefit the programming of the Kaneland Arts Initiative. Click HERE to purchase tickets to the Fine Arts Feast! Click HERE to see the auction and items and to get more information on the Blackhawks Raffle! On Saturday, February 27th, KAI brings to the stage GUYS IN TIES! GUYS IN TIES, is anelite traveling improv comedy troupe that present a hilarious and unforgettable show by combining wit, intelligence, humor and 18 years of experience. Some memorable names they have performed with or opened for are: Weird Al Yankovic, Norm MacDonald, Howie Mandel, Darrel Hammond, Sinbad, Brad Sherwood (Who’s Line is it Anyway) and much more. Their performances are family friendly. Online ticket sales are $10 for adults, $8 for senior citzens, and $5 for students. At the door, the prices are an additional $2. The GUYS IN TIES performance is part of the KAI Theatre Subscription Package, which gives an additional discount to those who sign up for a package. Click HERE to purchase tickets to GUYS IN TIES! Click HERE to get more information on the KAI Theatre Subscription Package! This year, Kaneland School District’s motto is “Proud to be a Knight.” It’s a motto to elicit pride and tradition and to focus on the amazing things that happen within our school district and ultimately out in the Kaneland Community and among the Kaneland Nation of faculty, staff, and students. The Kaneland Arts Initiative has much Kaneland Pride as we have cast, crew members, volunteers, and community members participating in our many events. We truly are a Kaneland tradition, 17 years strong, that evokes the idea of coming together to celebrate our appreciation of artistry and the Arts. This weekend, KAI is pleased to produce the World Premiere performances of Memorial Park, a play written by 2001 Kaneland graduate, Nic Wehrwein. The play is about an unlikely relationship between Mars, a 13 year old boy, and Fiddley Diddley, a drifter clown, that brings to the surface many past and current struggles with domestic and substance abuse. The message is simple: one’s future is not dictated by one’s past and is written beautifully through the relationship between Mars and Fiddley Diddley and supported by the other roles in the play. I am excited that KAI is able to produce this profound play that is both light at times and serious, but what is also exciting is the author itself, Nic Wehrwein. Nic was briefly my student as he was a member of the Kaneland band program, back when there was only about 30 kids in the program and yours truly was the director. He was a great kid – a guitar player in my jazz band and percussionist in my concert band – but not the “teacher’s pet” kind. He was the student with the ironic sense of humor and quick wit that reminded me that high school students are “changlings,” stuck somewhere between adulthood and adolescence. He and his classmates possessed a mature outlook on life, yet embraced it all the same with joy and laughter, but also with seriousness and calm. When he was cast as the role of Audrey, the Venus flytrap with a taste for blood in KHS’ spring production of Little Shop of Horrors, I knew he would be outstanding. I had the pleasure of conducting him, rather conducting AT him, as he was backstage watching me on a screen, while he waited for me to cue the camera so he could sing his part from backstage. The first time the audience saw him was his curtain call. I remember being very impressed with his ability to be patient, yet accurate with the tone and inflection of his part. He was a natural. Here we are on the eve of opening night of his performance and I am just as impressed with this Kaneland Knight as I was back in 2001. Nic has written a great piece with an honest message that exercises my mind and my emotions with each rehearsal I see. I am in awe of his ability to write real characters who come to life under Diane McFarlin’s always outstanding direction of an amazing and talented cast. When we hear the phrase, “Proud to be a Knight,” it’s hard not to think of feats of athletic prowess and skill, but this weekend, our pride will be on the stage through the words of Nic Wehrwein. I hope you’ll share this experience with us. As director and producer, Diane McFarlin and Maria Dripps-Paulson have over a gazillion years of experience in directing and producing Arts events. Together, they have worked on shows as a part of the Kaneland High School Theatre Department and even more as the director – producer pair for Kaneland Arts Initiative events. The list is lengthy, including performances such as Oklahoma!, Little Shop of Horrors, Music Man, Bye Bye Birdie, The Laramie Project, The Diary of Anne Frank. When asked what makes them successful, the two share a smile and without hesitation say, “Respect. Honesty. Friendship. A heavy dose of laughter, too.” Besides serving as the outstanding Artistic Director for the Kaneland Arts Initiative, Diane is an assistant principal at Kaneland High School, while Maria serves as the Kaneland High School auditorium manager in addition to her work as executive director for KAI. Both have families involved in the school district either as students or in other capacities and both live within the community as well. The concept of the SHOUT OUT! for education was born out of a performance that Maria did at Listen to Your Mother show. Created by blogger, Ann Imig, the mission of each LISTEN TO YOUR MOTHER production is to take the audience on a well-crafted journey that celebrates and validates mothering through giving voice to motherhood–in all of its complexity, diversity, and humor–in the form of original readings performed live on-stage by their authors. (from listentoyourmothershow.com) Maria performed in the Northwest Indiana LISTEN TO YOUR MOTHER performance in May 2014, an event Diane attended to support her friend. Even before the evening was over, Diane and Maria agreed that doing a similiar production with the topic of education would be equally powerful. The first SHOUT OUT! 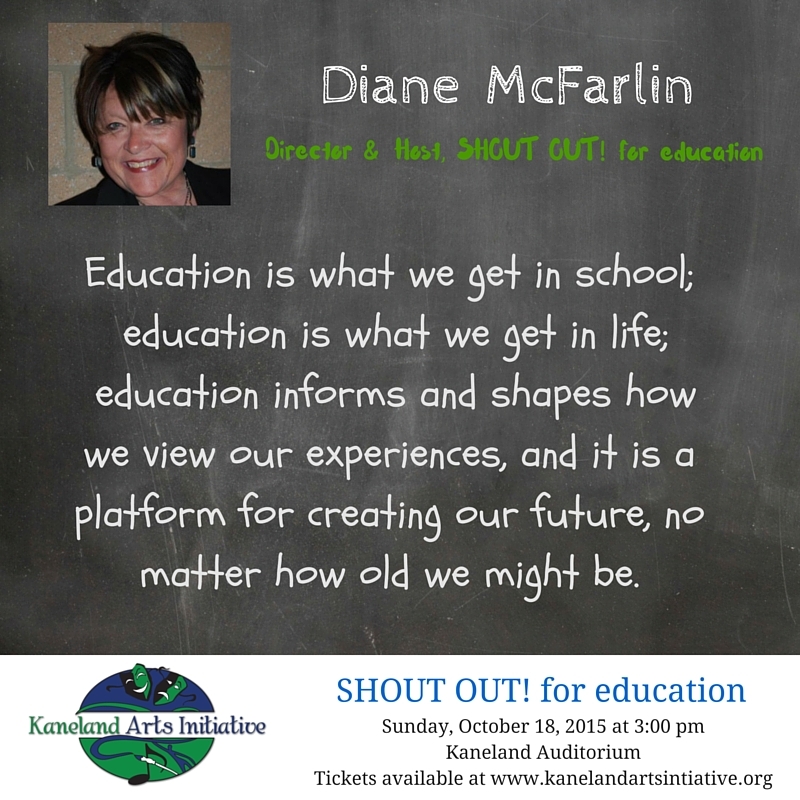 for education was presented on November 17, 2014 in Kaneland, under the direction of Diane with producer, Maria. Both Diane and Maria are thrilled to be presenting the performance again with a new cast on October 18th at 3pm. They also would like to invite guests to attend a reception following in the auditorium lobby. The SHOUT OUT! 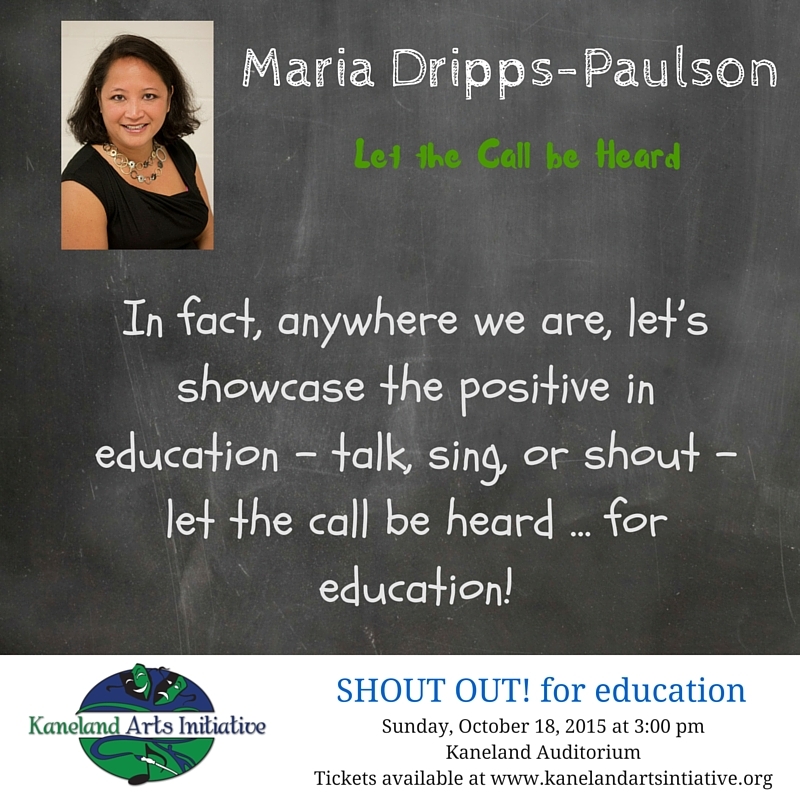 for education is the first performance of the 2015 – 2016 KAI season. Click here to purchase ticket to SHOUT OUT and to check out the great new theatre subscription packages as well as the rest of the great season for KAI. We’re thrilled to introduce you to Caitrin Mills! Caitrin is 18 years old and a 2015 graduate of Kaneland High School. She currently is a freshman at Waubonsee Community College, a Lucille Gustafson Scholar. She loves reading, watching TV, especially the Vlogbrothers, John (Looking for Alaska) and Hank (http://youngvlogbrothers.tumblr.com/), and is passionate about politics. So much so, that she is ecstatically looking forward to voting in her first presidential election in November 2016. She also works part time at Town and Country Library in Elburn and hopes to be a sign language interpreter after college. What is your educational background? If you’re still in school, what grade/level are you at? I’m halfway through my first semester at Waubonsee Community College, I graduated from Kaneland High School last May. If you are not employed, what do you want to be when you grow up? I’m currently working toward my Associates in Sign Language Interpretation. I hope to work in that field when I finish my degree. What do you do for employment? I work part time at Town and Country Public Library, where I am a page and do odd jobs for all the departments. Do you have a favorite story (that you’re not telling for the SHOUT OUT) that happened to YOU during your education? Winning the social studies senior award last year was an amazing honor. That was a wonderful night and a great memory. Do you have any favorite teachers? If so, why were they your favorite? Javier Martinez, for teaching history with a passion that I really related to and appreciated, and for asking me “so what?” Brian Kowalski, for giving me my first acting roles and my first solos, and for helping me out of my shell. Patty Welker, for teaching me new ways to read and appreciate stories and writing, and for always being willing to talk. What subject in school was your LEAST favorite and why? Math. Numbers are confusing. Who do you feel is the hardest working person in an educational system and why? I think that everyone who works in the school system works incredibly hard. Everyone I’ve ever interacted with within this system has been incredibly dedicated and invested. Did you walk to elementary school or ride a bus? Any funny memories? I walked. Once there was a day that there was an awful blizzard so school was canceled, but Mom had volunteer work to do so we had to walk there anyway. What excites you the most about education? Opportunities to learn more about people and the world. 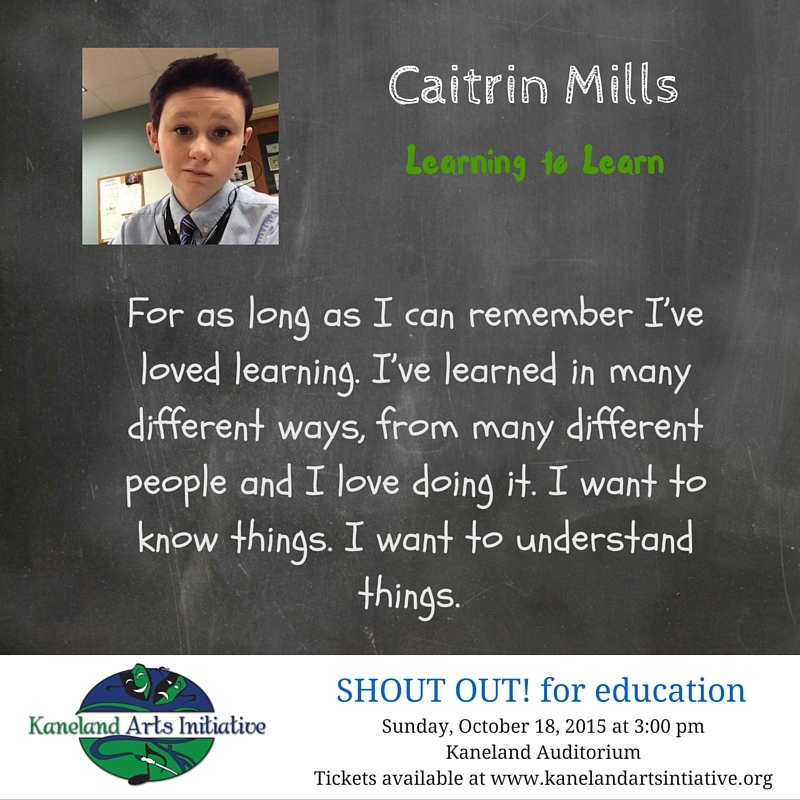 We are excited to hear Caitrin on Sunday, October 18th, read Learning to Learn. Our next spotlight …. PETER LOPATIN! If you are already employed, what do you do? I have worked in healthcare most of my professional career – often in strategic planning, business development, and operations. I am currently a Product Manager with CountyCare healthplan. What subject in school was your LEAST favorite and why? Probably math, which is odd because I work with data all the time in my professional life. I think the disconnect was that in school it was not taught with a sense of relevance, but in my day-to-day work, I apply it and use the numbers to help tell stories about how we can get better at what we do. Peter comes from a family that has always honored and respected education. His mother was a Reading Specialist in inner city Trenton, NJ and his father a pharmacist. Peter works in Health Care as a project manager and considers himself a “life long learner.” He is an advocate for every student having equal opportunities and serves on the boards of Kaneland School District #302 and Kaneland Arts Initiative. He has been seen as an actor in all 6 summer productions of KAI. He credits his family for teaching him the most. 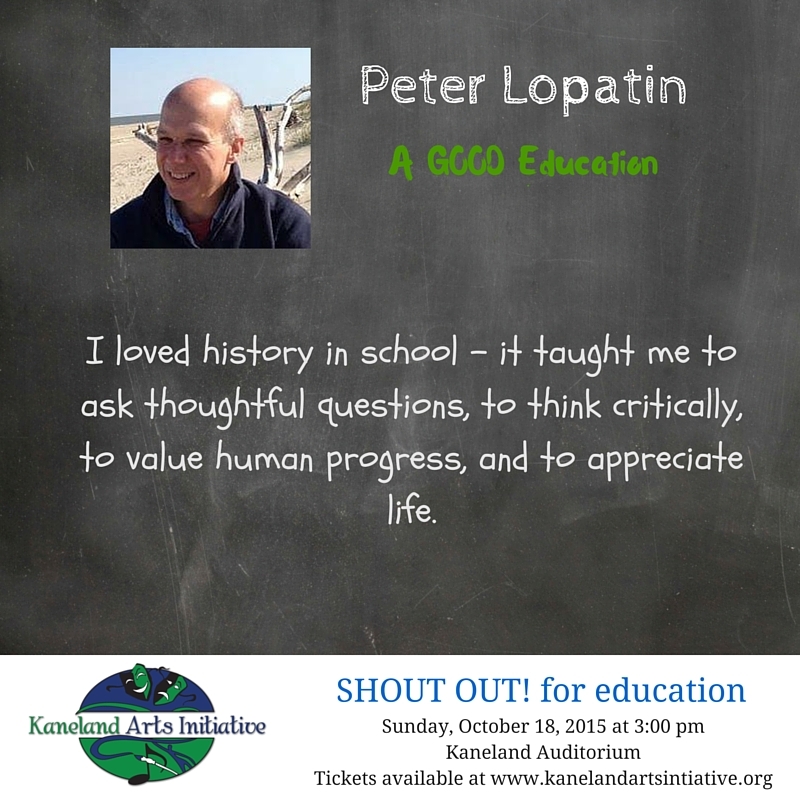 Peter will be reading his speech, A GOOD Education, on Sunday, October 18th at 3pm.